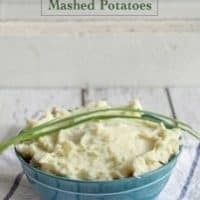 A recipe for garlic chive mashed potatoes and a story about my favorite mashed potato moment ever! My parents divorced when I was nine and I think it kind of threw them for a loop for a little while. I was so young that I was more aware of how I felt and I spent a lot of time trying to hide what was happening from my friends. I can only imagine how my mom and dad must have felt: confused, scared, angry, sad, and worried about their three young kids. My dad got an apartment a few blocks away from our family home and every day after school we would go there until my mom came to pick us up. It was great that he was so close. It was a confusing time, but I remember having fun. We played video games together, and a word game called Boggle. My dad would get us gummy bears and worms and we would separate them into colors, each color being assigned to one of us. We were weird kids. All of this was done in the kitchen, at a card table that had many purposes. It was the center of our gummy bear distribution and where we played our hours long Boggle matches. It was also our main homework station, away from the TV. One day, we were staying for dinner and my dad decided to make mashed potatoes. I was sitting at the table, half doing my homework and half watching him. Something was going on. The potatoes were boiling and were probably almost done. Instead of getting all of his ingredients together, he was staring into the open refrigerator with a perplexed look. See, he had hadn’t had time to go grocery shopping and was missing two of the main mashed potato ingredients: milk and butter. I imagine that if my parents were still their married “machine” that this probably wouldn’t have happened. But they weren’t and he was on his own to feed his 3 young kids and we wanted mashed potatoes. Now, I see this as a sign that creative cooking was in my genes. My dad pulled out a carton of vanilla ice cream and did his best to make mashed potatoes. I don’t really recall how it tasted – I don’t think it was horrible because I probably would have remembered if it was. I do recall his ingenuity and sometimes try to channel that when I’m in a similar situation in the kitchen. Well, not a no-butter, no-milk situation – those are always in my fridge now. 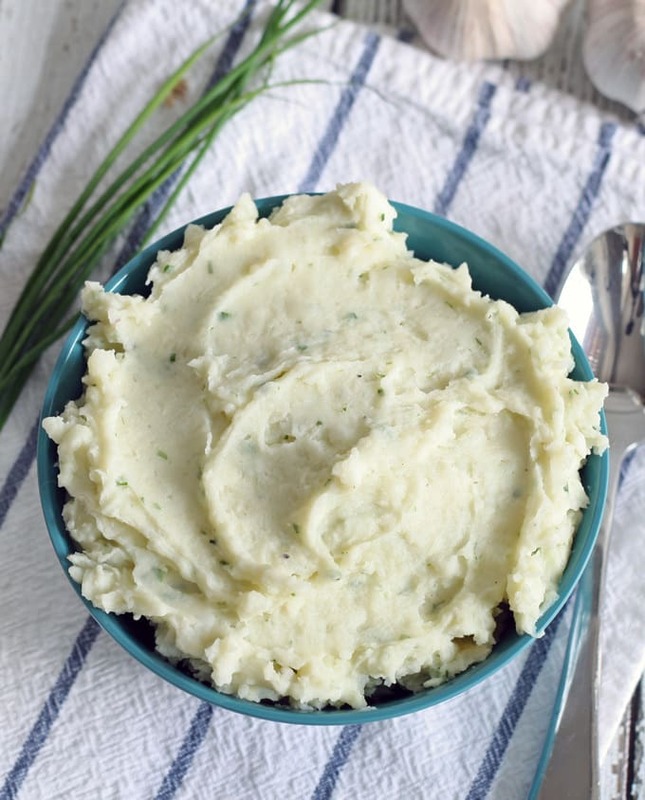 Don’t worry, garlic chive mashed potatoes do not include ice cream. They do, however, omit milk for creamy cream cheese instead. I just love how cream cheese and chives taste together. I also sautéed the garlic in the butter which really brings out the flavor. Garlic lovers, this one is for you. Cut and peel your potatoes into equal sized pieces. Place them in a large pot and fill the pot with water until the potatoes are just covered. Heat over medium/medium high heat. Cook until the potatoes are tender. Use a colander to drain the water out and then return the potatoes to the pot. In a small sauce pan or frying pan, melt your butter. When the butter is melted add the garlic and saute for 1-2 minutes. Then pour the butter garlic mixture in to the potatoes, along with the cream cheese and chives. 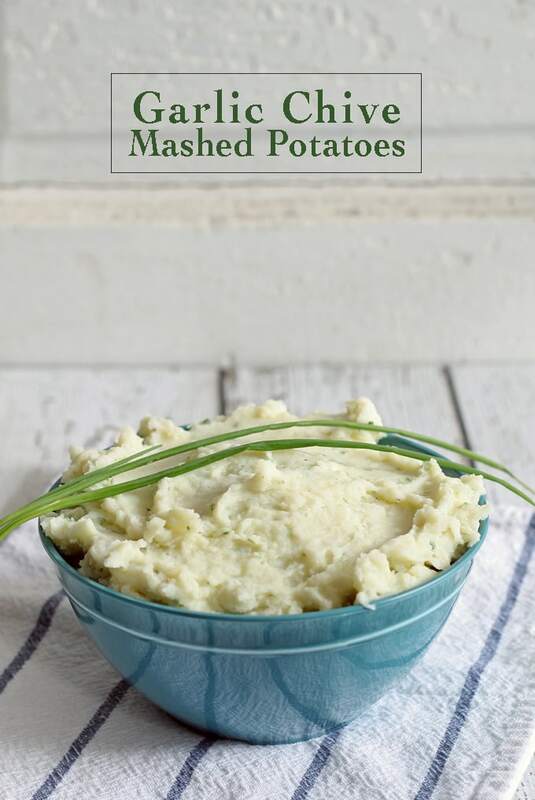 Mash with a potato masher, or use an immersion blender until your desired consistency is met. Add salt and pepper to taste. I love how your dad managed to try and save the potatoes. Holy cow these look amazing ! 🙂 I’ve pinned them! I love chives in mashed potatoes! So good! Wow – these look so good! I could just dig right in. I love the story about your Dad’s ingenuity and how he was able to think on his feet – brilliant idea! Thanks Patricia! 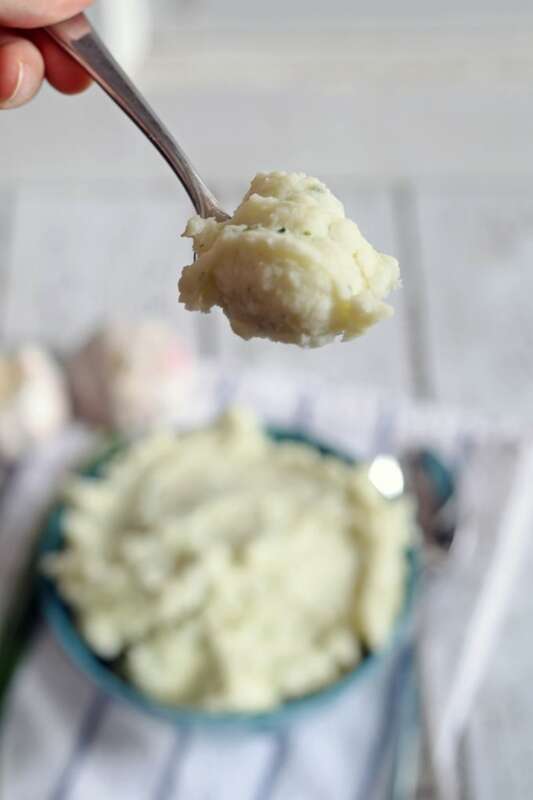 I’m tempted to try to make ice cream mashed potatoes again since I can’t remember if they were good or bad. Oh, I am sure the chives and garlic make the potatoes taste amazing! I am finally pinning some of last week’s link-ups. Thanks for linking up to Tasty Tuesdays at Creative K Kids. Hope to see you this week! Thanks for linking up to Saturday Sparks. These potatoes sound amazing. You have been featured today.